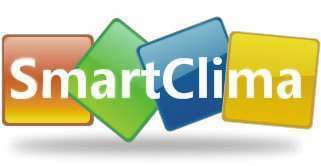 Please contact us to email: cooling@smartclima.com ,we can supply a favourite item you need. Thermoelectric cooling thermoelectric effect is the Peltier effect is mainly used in refrigeration technology. 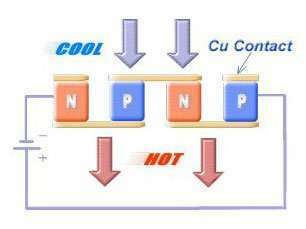 Practical thermoelectric cooling device is more significant by the thermoelectric effect, more efficient thermoelectric cooling semiconductor thermocouple composition. The semiconductor thermocouple and an N-type semiconductor P-type semiconductor. N-type material has excess electrons have a negative thermoelectric power. P-type material electron deficiency, there are thermoelectric power; when the electrons pass through the junction from the P-type to N-type, the energy will increase, and the increase of energy equivalent to the energy consumed by the node. It can be used to reduce the temperature difference to prove. On the contrary, when the electron current from the N-type to P-type material, junction temperature will rise. Direct contact of the thermocouple circuitry in the actual reference is not available, so the connection method instead of the graph, experiments show that the introduction of a third material (copper plate and connecting wires) does not change in the temperature difference between the circuit characteristics of the circuit. 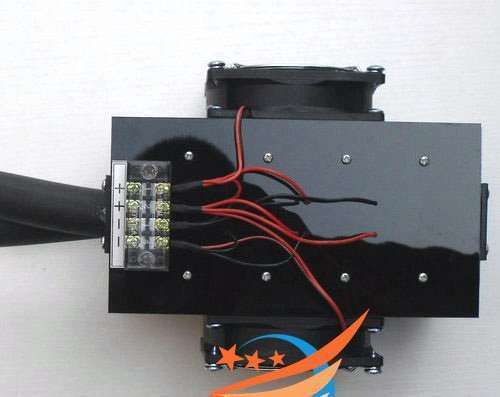 Thus, the semiconductor element can be connected to a variety of different methods to meet the requirements of users. 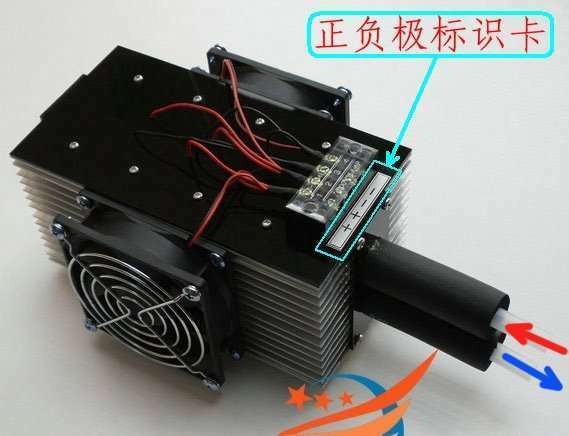 Put a P-type semiconductor and a link to the N-type semiconductor thermocouple, after connecting the DC power supply, will result in the joints and heat transfer temperature difference. In the joints, the direction of current is above N to P, the temperature drops and absorbs heat, which is the cold end. And in a joint below, to the current direction is P N, and the exothermic temperature rises, therefore the hot end. According to the figure of the plurality of semiconductor thermocouples connected in series on the circuit together, and in terms of heat transfer is in parallel, which constitute a common refrigeration thermopile. Press the icon connected to a DC power supply, the above is a thermopile cold side, here is the hot end. With a variety of heat exchangers and other heat transfer means, so that the hot end of the thermopile continues to heat and maintain a certain temperature, the cold junction of the thermopile into the work environment to the endothermic cooling, which is the working principle of thermoelectric cooling. 1. I do not know when the cold surface of the refrigerator, we can use this method, the positive power supply red and black wire to negative, and in the absence of thermal conditions, instantaneous power test, namely touch refrigeration the two ends, one side will feel the heat, one side slightly apathetic, heat one side of the hot side, the side of cold sensation. But time can not be more than 5 seconds, otherwise due to the hot end temperature is too high, can easily cause the device to burn. 2, under normal conditions, with red lead is usually expressed as positive: usually in black is negative, which is wiring methods thermoelectric cooler at work. Takes pyrogenic. As long as the current polarity can be changed. Refrigeration work must adopt switching power supply, power supply ripple factor should be less than 10%. 3, the number of ways to identify and limit the voltage, thermocouple refers to the number of P, the number of nodes N thermocouple cooler. For example: the refrigerator model is TEC1-12706, then 127 for cooling the thermocouple logarithm, 06 to allow the current value: A, cooler ≈ thermocouple voltage limit on the number × 0.12, for example: TECI- 12706 limit voltage V = 127 × 0.12 = 15.4 (V). Normal operating pressure is 78% limit voltage, such as TEC1-12706 operating voltage of 15.4 * 0.78 = 12.01V. 4, both in the use of various refrigerating machines or in the test, the temperature of the refrigerant caused by hot and cold heat exchange surface should be brought to room temperature (generally 15 minutes or more). Otherwise easily lead to damage to the refrigerator. 5, in order to prolong the life of the thermoelectric cooler, refrigeration components of four weeks to respond to seal deal. We have two kinds of methods, one is the use of silicone seal 704; another is taken epoxy sealed, sealed refrigeration purpose is to make the thermocouple is completely isolated from the outside air. Plays a moisture-proof effect, and can extend the life of the refrigerator. 6. When installing, first wipe clean both sides of refrigeration components and evenly coated with a thin layer of thermal grease were hot and cold surfaces in the refrigerator. Aluminum radiator or surface storage fins in contact with the cooler should be smooth, and wipe clean, but also the surface evenly coated with thermal grease; cooling device during the installation process and cold storage must good contact cold, hot surfaces should be fully in contact with the surface of the aluminum radiator (eg with screws, a few screws force should be uniform, not excessive or uneven force). To achieve the best cooling effect, between the cold storage insulation and aluminum radiator filling applications, its thickness is generally 25-30mm appropriate. 7, install pressure refrigeration piece recommendations between 150PSI to 300PSI, the pressure is too low will make poor contact chip cooling contact surfaces, too much pressure can damage the chip cooling. 8 users without special equipment, the qualified judge cooler or not, mainly to test its resistance. You can use the data bridge or ohmmeter, measure the resistance of the refrigerator with compensation. Refrigeration components with a multimeter to test the static resistance is not accurate, just for reference. 9, in the handling and installation process of the refrigerator, the operator should be gently strictly prohibited refrigeration piece fell from a height, even at the height of 10-20cm also cause significant internal resistance of the refrigerator changes, resulting in damage to the cooling device.